Grand Rapids Gymnastics is proud to offer host hotels at exclusive rates to attendees of the 2015 Gymnastics on the Grand Invitational. The hotels are connected via enclosed skyway to DeVos Place and offer free self-parking -- once you park your car for the weekend, you can stay out of the winter weather! At this time THE HOTEL Group Blocks are full. Please Check back with these hotels periodically as soon as the Gymnastics on the Grand session schedule becomes available, as it is likely that rooms will open up. we ask that If you have booked "extra" rooms or room nights in ANY OF THE the GROUP blockS, please release those that you do not need as soon as possible. THis will allow more athletes, teams and families to make travel arrangements and room reservations under the discounted group rates. *NOTE: For easy online booking, use the Online Reservation system, or you may use the special toll-free numbers listed above for this hotel and mention Gymnastics on the Grand. Discounted rates are only available for reservations made before November 11, 2015, and will likely sell out prior to that date, so please plan accordingly and BOOK EARLY! 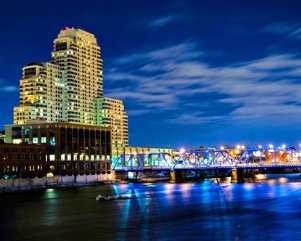 Located in the heart of Downtown Grand Rapids within the entertainment district, the 214-room Downtown Courtyard by Marriott offers travelers convenient access to the DeVos Place Convention Center, Van Andel Arena and dozens of cultural attractions, restaurants and night clubs. Each of the 340 rooms and suites at the JW Marriott are designed to reward the senses and comfort the spirit. Outfitted with dozens of thoughtful details, the JW has thought of everything and have left nothing to chance. JW Jack Pack that allows you to hook up and recharge your laptop, mobile phone, iPod, etc. This all-suite hotel is 5 miles (8 minutes) from DeVos Place Convention Center, the Gymnastics on the Grand meet venue. Country Inn and Suites - Grand Rapids, East offers studio or 1-bedroom suites and treats guests to comfortable lodging, quality services and a friendly atmosphere. To book online with the group rate: click "More Search Options" and enter "GYMGRA" in the text box that says "Enter Code or ID"
**NOTE: The group rates of $109.99 to $129.99 plus tax per night are available for reservations staying Thursday, December 3rd through Saturday, December 5th. Discounted rates are only available for reservations made before November 13, 2015, and will likely sell out prior to that date, so please plan accordingly and BOOK EARLY!